Interstate 5 runs along the entire West Coast of the United States, connecting American cities from Mexico to Canada. When Interstate 5 came through Seattle in the 1960s, it may have connected Seattle to far-flung places, but it divided the city right down the middle, separating downtown from neighborhoods to the east and changing the character of the areas adjacent to the roadway. To put it plainly, the new highway was loud. It was big. And it was ugly. Before I-5 was completed, the community was talking about ways to address the environmental, aesthetic, and urban planning problems it presented. The idea wasn't to completely hide the highway so much as mitigate it, complement it, and weave back together the neighborhoods on either side as much as possible. Facing a daunting design challenge, landscape architect Lawrence Halprin came up with an approach that established a whole new kind of park: five acres of green and community gathering places, resting on a "lid" over a depressed portion of the highway. The park is divided into a series of pathways and clearly defined gathering spaces such as "The Canyon" and "The Cascades," fountains where flowing water distracts people from the cars speeding below them. To address the many engineering challenges of building atop a highway, Halprin employed a variety of innovative strategies, including lightweight soils and shallow planting beds. In keeping with the context of this new kind of park, Halprin applied a Brutalist style, with molded concrete forms echoing the highway infrastructure all around it. Water features and green landscapes add a natural aesthetic with an urban edge. Freeway Park solved a problem for Seattle and paved the way for other communities to regain ground lost to highways. The "lid" idea has since been replicated or adapted in cities across the country , including a proposed further covering of I-5 in Seattle. 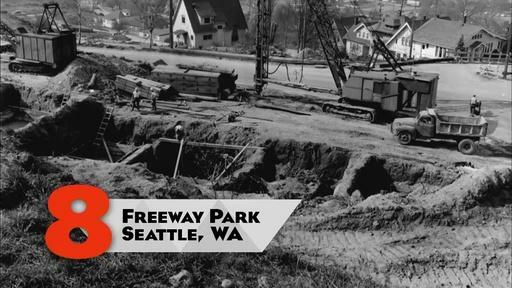 Learn more about Freeway Park. Plan a visit to Freeway Park. 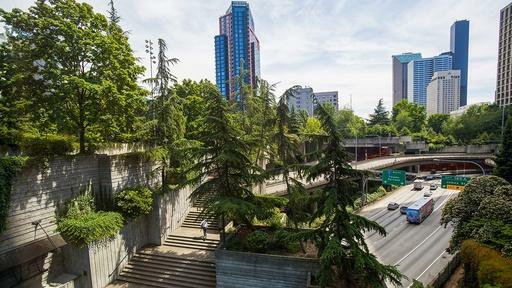 Freeway Park addressed environmental, aesthetic, and urban planning problems created when Interstate 5 cut through downtown neighborhoods.